The Sololift2 WC-3 is a small, compact automatic lifting station with 3 additional inlet connections suitable for pumping domestic wastewater from a cabinet shower, bidet, washbasin as well as sewage from a toilet. 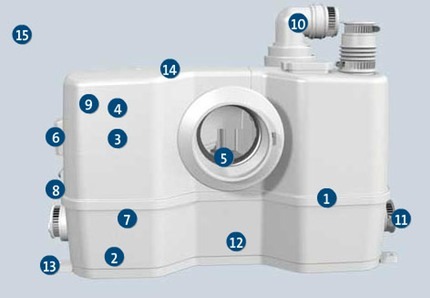 Fast, easy and clean maintenance and servicing make the Grundfos Sololift2 the perfect Macerator for your Bathroom. Welded, pressure tight tank design. Powerful motor with special winding. Dry-motor design for easy and clean service. Motor, pump and controller unit are integrated into one for easier serviceability & replacement. The SOLOLIFT2 will remain in place for entire service. Self-adjusting auto coupling eases assembly in service case. Separate drain function by socket and drain hose. Pressure switch control is outside the tank, so there are no moving parts inside the wastewater. More compact design. Can easily replace any macerator product on the market. Selectable outlet direction for easy replacement. Innovative bottom design with a strong chamfer and a self cleaning function to avoid sedimentation. Uplift fixing with clip makes the SOLOLIFT2 easy to install. Alarm device easily retrofitted - just insert a small PCB with buzzer. One motor for all models.